While many of our fellow ordinands training at Ridley Hall, Cambridge were heading off this summer for parish placements across the UK, we set off for Jerusalem where we had arranged a placement at St George’s Cathedral. We weren’t sure what to expect or how much we’d be able to help – but from our first day were given sacristan duties, leading evening prayer, and helping out in both the Cathedral and Diocesan offices. Our whole time on placement was a wonderful learning experience – from the necessity of coffee to any social interaction in Jerusalem, to the liturgical richness of St George’s, to the beauty as well as challenge of bilingual worship, and the sheer amount of work done by a surprisingly small staff team! 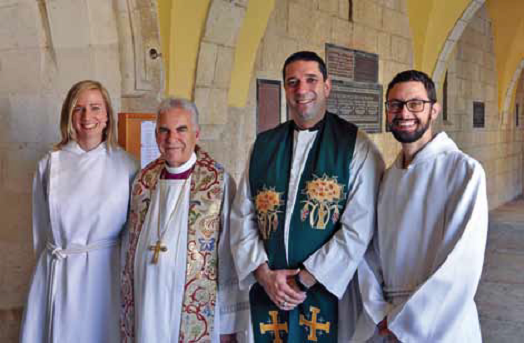 One of the things which struck us most is how the Anglican church in Jerusalem is at once both deeply embedded in its local context – and seeks to faithfully minister to and support its indigenous community – yet at the same time has an international reach and profile, with hundreds of pilgrims coming through its doors each week. At times this created some excitement – like the morning we were setting up for the small 8am Eucharist in a side chapel, only to discover a Ugandan bishop and sixty pilgrims were about to arrive unannounced, prompting a hurried move to the nave! We enjoyed spending time exploring the sites of Jerusalem, which brought our theological studies to life. Again and again you are struck that even if an event didn’t happen in the exact place claimed – it happened somewhere, probably very nearby. But of course, there is so much more to the Christian experience of the ‘Holy Land’ than churches. It was our privilege to worship and work alongside Christians who witness with their lives to the continuous Christian presence in that land for two millennia, and it was encouraging to see their ongoing role serving not only their own community but the whole community – through its institutions, of which the Diocese is rightly proud, but also through its quiet determination to remain a gracious and faithful Christian presence, helping bring greater unity between the churches in Jerusalem, and witnessing to the possibility of peaceful living to the wider community. We are very grateful to Archbishop Suheil Dawani, Dean Hosam Naoum, and all the Cathedral clergy and community for welcoming us in Jerusalem – and for the other clergy and congregation members we met from different churches in the Diocese. And we are grateful to JMECA for enabling us to go on what we believe has been a life-changing placement during our training for ordained ministry. Already we are planning when we can return to visit the Diocese of Jerusalem again!